Multiple violations of law and irregularities make a new election necessary. An investigation is required to determine exactly how widespread such violations have been and to disclose this information to the membership. Existing documentation of violations is sufficient to warrant a new election. 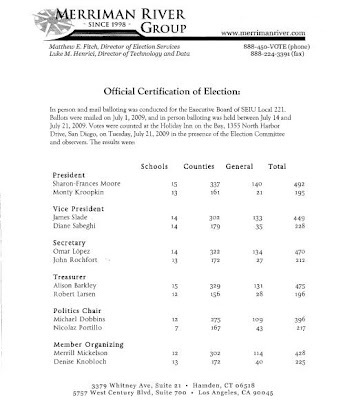 Many members did not receive mail ballots, notice of election, and/or the candidate statements voter information booklet, which were supposed to be mailed to all members of Local 221. Many members who did not receive said election materials report that they have not changed their address and have received other mailings from SEIU Local 221, including a mailing done by the Unity Slate to campaign for this election. Mailings for candidates/slates were done by Select Mailing, using member name and address data provided by Local 221. Matthew Fitch stated in an email of July 22, 2009, that 7137 mail ballots were mailed out (fewer than the 7,692 members reported in the local’s 2008 LM-2) and that 652 of these were returned by the post office. Thus, it appears that 1207 members in good standing did not receive a mail ballot. It is likely that these same members also did not receive the mailed notice of election and did not receive the mailed candidate statements voter information booklet (which also contained the notice of in-person polling locations and their dates and hours of operation). With only a total of 750 ballots cast, this 1207 number would clearly be determinative of the outcome. It seems that, once again, the nice folks at SEIU have figured out how NOT to run an election. Go and read the supporting documentation - it tracks very well with the complaints that the former Stern-appointed incumbents of SEIU 888 were using in their challenge to the outcome of their election. In any event, it appears that there was a deliberate and systemic attempt within SEIU 221 to suppress the vote total in their first election since formation of that local. 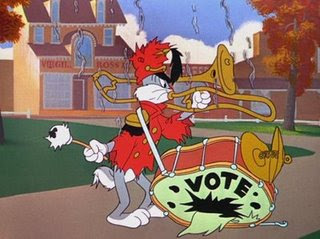 Suppression of the vote is a tactic usually seen in the mists of history during the bad old days of Jim Crow, but evidently it's been brought out again and given a shiny, new face by Our Glorious Maximum Leader and his appointed cronies at the California Mega-locals. Go and read the supporting documents at Monty's site, and witness for yourselves how our dues dollars at work, folks.